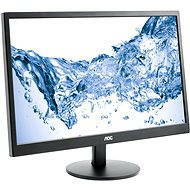 The modern 21.5" AOC monitor comes with a pleasing affordable price tag and besides just the usual office work, you can also use it for watching movies and playing games. Full HD resolution, a very fast response of 5ms (GTG) and low power consumption are among the main advantages of the panel. Other features include a Kensington security lock slot and the ability to split the screen into separate panels (Screen +). Like any IPS matrix panel, it has great viewing angles of 178°/178°, realistic colour rendition and excellent 1,000:1 contrast ratio. There are two HDMI and VGA (D-Sub) connectors and an increasingly popular DisplayPort for uncompressed signal transmission to connect to the computer. The brightness is 250cd/m2, and you can adjust it with the contrast and other screen features in the easy-to-read monitor interface. MHL (Mobile High Definition Link) technology lets you connect an Android mobile phone or tablet. The monitor consumption is an impressive 23W, making it environmentally friendly and saving you money on energy costs. With its pleasant design, it's suitable for both the home and office environment. It can be mounted on a wall and is compatible with the VESA 75mm and 100mm mount. HDMI 1.4 and older	, D-SUB (VGA), DisplayPort Done! VGA cable, HDMI cable, 3.5mm jack cable, Power cable Done! 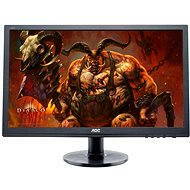 For shipping to other EU countries visit this page 22" AOC i2269vwm. Für Versand nach Deutschland, besuchen Sie bitte 21.5" AOC i2269vwm. Chcete doručit zboží do Česka? 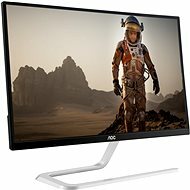 Prohlédněte si 21.5" AOC i2269vwm. Chcete doručiť tovar na Slovensko? Prezrite si 21.5" AOC i2269vwm. Für Versand nach Österreich, besuchen Sie bitte 21.5" AOC i2269vwm. Magyarországra történő kiszállításért tekintse meg ezt a termékoldalt: 21.5" AOC i2269vwm.